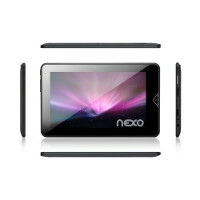 NEXO is super-3G Android tablet that provides unlimited opportunities through access to Google Play. The nature of the device is reflected in the perfect synergy between the polished hardware and software offering unlimited possibilities for use of the device. The latest technology used in the tablet offers you full comfort of a wide range of dedicated applications. NEXO beauty 3G has its source in precious materials from which it is made. The aluminum casing not only provides light weight and prestige, but it makes it very durable. Its design, ease of use and impressive specifications make it difficult to part with it, even for a moment. Remember that entered PIN on the website must be exactly the same as PIN entered in the setup program on your Nexo 3G.